John Chidley Hill.com A blog about reading, writing, pop culture and sports. 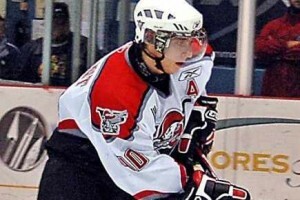 Gabriel Dumont of the Drummondville Voltigeurs socred in each period Friday night. This week junior hockey fans were treated to some great match-ups that might be previews of playoff matchups. Friday night two of the highest seeds in the Quebec Major Junior Hockey League locked up as the Drummondville Voltigeurs beat down the Quebec Remparts 8-2. Even after absorbing the loss, the Remparts are in first in the Eastern Division. The win was more significant for the Voltigeurs who continued to put distance between themselves and the Victoriaville Tigres in the Central Division. The game was headlined by Gabriel Dumont, who scored a hat trick for Drummondville and continues to be one of their strongest players. On Saturday night the Barrie Colts dumped the Windsor Spitfires 8-5 in another high scoring game. I’m not big on publicizing my predictions, but I wholly expect that this game could be a preview of the Ontario Hockey League’s playoff finals. The Colts have dominated the league’s Eastern Conference, not just clinching a playoff berth but also a title. Meanwhile, the Spitfires have been strong in the Western Conference, putting a virtual all star team on the ice every night. They’ve also got the psychological advantage of being last year’s Canadian Hockey League champions. Alex Hutchings and Darren Archibald both scored twice for Barrie, indicating that Windsor might not repeat as Memorical Cup Champions. This weekend was a good indication of what the postseason has in store. When two top-ranked teams meet, it's supposed to be a close game. It was a home coming of sorts for goaltender Adam Courchaine of the Erie Otters. Forward C.J. Stretch made sure a milestone night for goaltender Kurtis Mucha was extra special. Antoine Houde-Caron and the Shawinigan Cataractes had one of the biggest wins of their season Saturday night. In a likely preview of the John Ross Robertson Cup, the Barrie Colts downed the Windsor Spitfires. The Regina Pats kept their playoff hopes alive with a much needed win Saturday night. Richard Martel will have to wait a week for his next chance to make history. The Plymouth Whalers earned a playoff spot in style Sunday afternoon.